PDF Page Size Editor is application increase decrease size of height & width of pages into Adobe PDF file. PDF Page Size Editor also modifies page size in customized pages such as odd/even pages, single or various pages and any page range. These tools resize them very simply and speedily and you can set page in potrait and landscape mode. PDF Page Size Editor gives to choice to set PDF Meta properties i.e. Title, Author, Subject and Keywords. PDF Page Size Editor has very best GUI and this tool is user friendly. This software properly runs on windows 2000/XP/Vista/7 and both 32& 64 bit platform. This software can change all pages in standard size i.e. A0, A1, A2, A3, A4, A5, RA0, B0 and also change customized length width of page size. 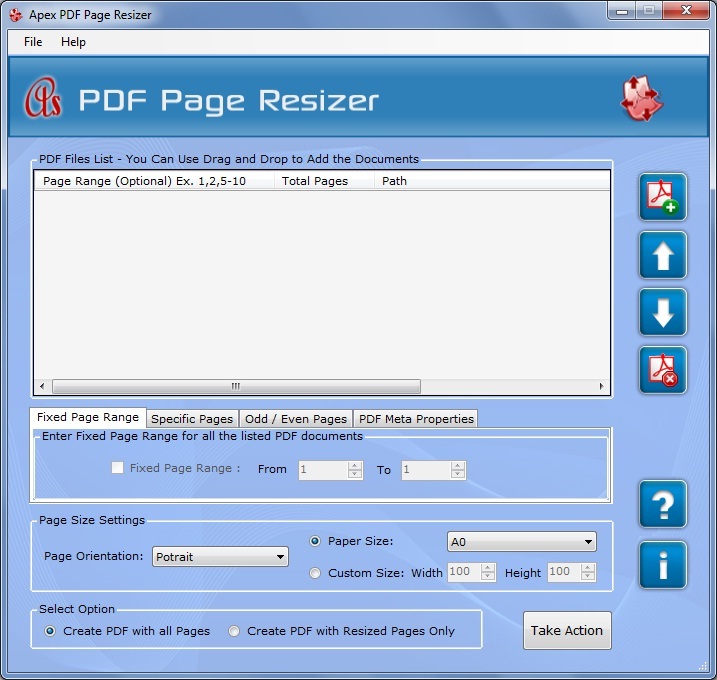 PDF page dimension changer software has many options to resizing the pages like change odd/even page size change or some specific pages and you can set page in portrait & landscape mode. PDF Page Size Editor provides all solution for any problems related with PDF page sizes. With this software you can create new PDF documents with all the pages or with only resized page. * Offers several methods to resize pages of PDF Files. * Change pages according to predefined paper size or custom page size. * Generate a new PDF file by resizing pages of PDF documents. * Create new PDF with all the pages or resized pages only. Qweas is providing links to PDF Page Size Editor 2.3.8.2 as a courtesy, and makes no representations regarding PDF Page Size Editor or any other applications or any information related thereto. Any questions, complaints or claims regarding this application PDF Page Size Editor 2.3.8.2 must be directed to the appropriate software vendor. You may click the publisher link of PDF Page Size Editor on the top of this page to get more details about the vendor.